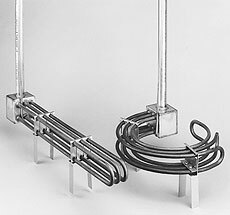 Tubular heating elements are brazed into a junction box. All wetted parts of TLO & KTLO Series heaters are steel. Sludge legs (to keep heated portion of the unit off the bottom of the tank) are standard. Medium weight oils, alkali, soaking cleaners, degreasing solutions, caustics, solvent type oils, heat transfer fluids. * Designate voltage, i.e. insert 240 for 240 V or 480 for 480 V.
참고: Model TLO-2 and KTLO-2 Series are available in 4 kW units. contact OMEGALUX™ for details.